Buy Printer Epson Expression Home XP-800 with CISS and make 30 times more quality prints for the same money! We wish to represent you a new excellent model of the Epson Expression series − the Printer XP-800. 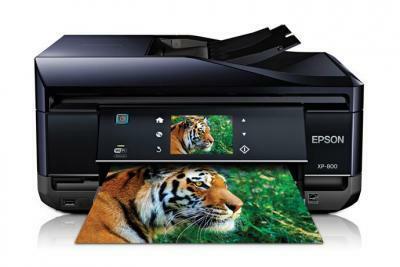 This creation of Epson includes the photo lab in itself, which can function as, a fax, a printer, a copier and a scanner. This is a multifunctional printing device which can brag of splendid performance and print quality. The Printer Epson Expression Premium XP-800 will give you an opportunity to enjoy the printing process, and many additional peculiarities will make operating with it even more easy and more convenient. It`s worth to take notice to the model for all who are keen on photography, the images printed by means of it. You will never stop being pleased with their quality and the color playback will compete with modern photo laboratories. The Epson XP800 has a pretty compact and moderate design, the developers focused on the ease of use and practical functionality of the printing device. Printer speed is still quite high. Monochromatic performance printing mode reaches 40 pages/minute and printing a photo will be done in 12 seconds. In comparison with other models of the Epson Expression XP-200 and XP-400 this model has even higher scanning resolution of 4800 x 4800 dpi. A colorful LC-Display with the 8.8 cm diagonal and a sensor touch control panel is noticeable in Epson Expression XP-800, using which we are able to install applications and control our device. One of the creative solutions of the creators of the MFD is ability of printing on CD/DVD disks; this device has an additional pallet with specific surface for inkjet printing. The producers of this inkjet printer tooled their creation with all innovations of the latest modern technologies, fro making work with the MFP even more convenient for users. The printer Epson XP-800 amazes us with the embedded card reading device, that maintains most of modern flash drives types, and inbuilt Wi-Fi module. The modern Wi-Fi Direct module gives you an opportunity to bind the printer with mobile devices directly. There is no need to make special installation, and the connection is done in no time. The Wi-Fi Direct lets several devices to connect between each other and the printer without any additional communications. The multifunction Epson Expression Home XP-800 maintains the Epson Connect service, by means of which we can scan or print documents from tablet PCs, mobile phones and other devices with iOS or Android remotely. We have only to install a free application named Epson iPrint. What is especially interesting and even necessary sometimes, it is to print from any corner of the world. For this reason Epson Connect made the application called Epson Email Print вЂ“ it lets printing photos or documents through e-mail. The Printer Epson Expression Premium XP-800 works on the unique piezoelectric printing technology of Epson. 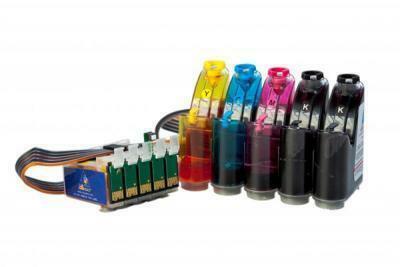 The main part in all models of Epson inkjet printers is the printhead MicroPiezo. Such way of printing is peculiar with high resolution and quality. The droplet size is only 1.5 Pico liters, and the droplet itself makes a circle, which is also definitely put onto the paper sheet. One of the main parameters of the MicroPiezo printing technology is longevity. Even heavy and regular usage will not hurt your device. This model as well as well as any other inkjet printer has a noticeable problem is in expensive original consumable materials. With the invention of the CIS system printing became less expensive in 30 times. The Inksystem company offers guaranteed high quality and reliable system of CIS, using which you will enjoy process of printing for a long time. This multifunctional device combines functions of a fax, a scanner, a copier, and a printer in one compact unit. The additional peculiarities, that make operating with it easier and more comfortable, cannot leave indifferent any lover of office equipment. In addition, printing of high quality will soon let the Epson XP-800 to become a favorite MFP among world customers.